Real wages have fallen for the first time in 30 months despite a drop in unemployment to a level last recorded in 1975. The Office for National Statistics said that earnings growth excluding bonuses fell by 0.2 per cent in the three months to March, after accounting for inflation. Regular pay growth slipped to 2.1 per cent in March and on Tuesday figures showed that inflation jumped to 2.7 per cent last month. Inflation has accelerated since the Brexit vote as the fall in sterling has driven up the cost of imports. The bleak news on incomes underscored the unusual dynamics in the labour market, as jobs growth has continued to race ahead. “Britain kicked off 2017 with a renewed jobs boom and a painful pay squeeze,” the Resolution Foundation, a think-tank, said. Unemployment fell to 4.6 per cent in March, from 4.7 per cent, as 122,000 more people found work in the past three months, the ONS said. The employment rate, which measures the proportion of working-age people in jobs, hit another record of 74.8 per cent. At 31.9 million, the total number of Britons in work was also at its highest level. Britain’s labour market is now tighter than it has been in four decades, with the number of people out of work per vacancy slipping below two for the first time on record. 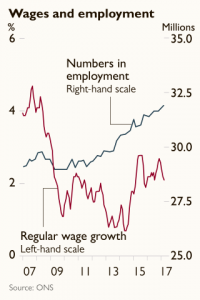 At such low levels of unemployment, wages would normally be expected to rise rapidly. Instead they are roughly half the average pace of growth experienced before the financial crisis. Pay rises have struggled to break through 2.5 per cent since the recession, leaving living standards exposed to the risk of rising inflation that has materialised since last June’s European Union referendum. However, the persistently weak rate of wage growth has been attributed to Britain’s poor productivity, which predates the Brexit vote. Official productivity figures released yesterday suggested that there was little respite in sight. Productivity, which is key to future prosperity, fell by 0.5 per cent in the first quarter compared with the previous quarter as GDP growth slowed to 0.3 per cent and hours worked rose rapidly. It was the first fall since the final quarter of 2015. “The combination of rising inflation and poor productivity paints a grim picture for living standards,” Gerwyn Davies, labour market adviser at the Chartered Institute for Personnel and Development, said. Confirmation of the pay squeeze raised concerns about the sustainability of Britain’s economic growth, which has in the past been dependent on consumer spending. “As well as hitting UK workers in their pockets, this fall in real regular pay also potentially puts at risk an economic recovery that has been reliant on strong consumer spending,” Mr Davies said. His institute recently said that employers planned to restrict staff pay settlements to 1 per cent this year. The bank is expecting the economy to grow by 1.9 per cent this year, better than the 1.8 per cent recorded last year. The Bank’s monthly agents’ report, released at the same time as the ONS data, said that “consumer spending growth had moderated in real terms, as spending power had been hit by higher prices”. Yet it also noted that “recruitment conditions had tightened a little further, with skills shortages reported in a wider range of activities”.